December 7 to December 27 in the Special Promotions > Limited Time category in both Reboot and non-Reboot worlds. Cherry Snow Cap (F), Cherry Snow Outfit (F), Mint Snow Cap (M), Mint Snow Outfit (M), Snowflake Rod, Sky Blue Goggled Beanie, Starry Sky Blue Beanie, Cheering Blue, Snowman Padded Jacket, Blizzard Stick, Beanie Headphone, Snow Earrings, Vintage Muffler Jacket, and Piggyback Snowman! Available starting December 7 in the Special Promotions > New Arrivals category in both Reboot and non-Reboot worlds. Do you want to change the names of characters on your account? Purchase a name change coupon and speak to Mr. Newname in the Event Hall to change your name instantly! This brand-new coupon allows you to change the name of your character right now—no need to wait for it to be processed during a maintenance! Click here to learn more about the new Character Name Change Coupon. December 7 to December 15 in the Special Promotions > Limited Time category in both Reboot and non-Reboot worlds. Check out the Male Hairstyles available now: Silver Rain Hair, Light 'n' Layered Hair, Peculiar Hair, Lop Ear Hair, Wolf Tail Hair (M), Cute Boy Hair, Heavy Metal Hair, Sweet Kitty Hair, and Wild Tangles Hair. Check out the Female Hairstyles available now: Scarf Hair, Glowy Butterfly Hair, Designer Hair, Loverly Hair, Sugar Candy Hair, Fluffy Pigtails, Calm Wave Hair, Bloom Hair, and Lop Ear Hair. Check out the Male Face Styles available now: Arrogant Face, Piercing Gaze, Bright Eyes, Sparkling Face, Distant Gaze, Mysterious Face, Cartoon Face, and Neinheart Face. Check out the Female Face Styles available now: Odd Eye, Bright Eyes, Wounded Look, Insolent Face, Pure Gaze, Piercing Gaze, Puppy-Eyed Face, and Spica Face. On December 10 and 11, we will be having a special deal on 8-Slot Inventory Expansion Slots! Get ready to expand your inventory! You have until 11:59 PM Pacific on December 11 (2:59 AM EST / 8:59 AM CET / 6:59 PM AEDT on December 12) to purchase these items at a discount! On December 10 and 11, we will be having a special deal on 1-Day 2x Coupons! Get twice the amount of EXP and drops for one whole day! The coupons activate immediately after purchase, so you can start immediately. You have until 11:59 PM Pacific on December 11 (2:59 AM EST / 8:59 AM CET / 6:59 PM AEDT on December 12) to purchase these items at a discount! December 7 to December 15 in the Special Promotions > Discounted category in both Reboot and non-Reboot worlds. You’ve got a pet. Now you can get a package that contains pet food and lots of useful skills your pet can learn! This package is just what the new pet owner needs! December 7 to December 20 in the Special Promotions > Limited Time category in non-Reboot worlds only. These little seal pets love the ocean! Take home the Sailor Seal, Admiral Seal, or Steward Seal. Summon a seal pet to obtain the Sealors Unite skill, which increases your Weapon and Magic Attack. This skill grows stronger as you equip more Sailor Seal pets. These pets come with an equip to wear, yummy pet food to eat, a Pet Name Tag, and some useful pet skills and scrolls. December 7 to December 15 in the Special Promotions > New Arrivals category in both Reboot and non-Reboot worlds. Get cozy and ready for winter with this package of permanent equips! December 7 to December 20 in the Special Promotions > Limited Time category in Reboot world only. These little seal pets love the ocean! Take home the Sailor Seal, Admiral Seal, or Steward Seal, and let these little buddies join you on your adventures in Reboot World! [Updated 12/7] Marvel Machine will end on Sunday, December 11. Marvel Machine is back! The Marvel Machine is a game which allows you to play for in-game equipment and Cash Shop items on the MapleStory website. However, the Marvel Machine is only available for a limited time! You don’t want to miss out on the chance to attain these highly desired items! During the event period, purchase spins for the Marvel Machine on the MapleStory website and receive three random prizes for each spin you use! Prizes consist of a mix of in-game and Cash items, and you get to keep all three. If you really like what you get, you can purchase a Double Marvel spin which will randomly double one of the items you just won! Some of the possible prizes you can win include BRAND NEW White Cubes, Violet Cubes, A-Rank Nebulites,Frenzy Totem, 20-Slot Bags, Permanent Pendant Slot Expansion Coupon, Permanent Hyper Teleport Rock Coupon (tradeable), a BattleRoid Coupon, Transparent Equipment Covers, Seasonal Surprise Style Boxes, Maple Points Coupons, and more! Don’t forget, you get THREE prizes for every spin, but your only chance to win is during the event period starting December 2--- so spin away! Note: Prize codes can be redeemed in non-Reboot worlds only. Click here to learn more about Marvel Machine! November 30 to December 20 in the Special Promotions > New Arrivals category in both Reboot and non-Reboot worlds. Snowman's Red Scarf Label Ring, Snowman's Red Scarf Chat Ring, Fairy Knit Hat, Sweet Snow Flower (F), Snow Angel, Fluffy Snow Bunny, Fresh Ice (F), Heart Pudding Slippers, Polar Bear Hat, Winter Snowman, Snow Bear Scarf, Polar Bear Hood, Polar Fur-Trimmed Dress, Angelic Polar Cape, and Polar Booties. December 1 to January 1 in the Special Promotions > Limited Time category in non-Reboot worlds only. November 30 to December 15 in the Appearance category in both Reboot and non-Reboot worlds. Check out the Male Hairstyles available now: Rebel Boy Hair (NEW! ), Wolf Tail Hair, Forest Fairy, Wanderer Boy, Sea Hair, and Prince Cut. Check out the Female Hairstyles available now: Takenokonoko Hair (NEW! ), Rebel Girl Hair (NEW! ), Vella Hair, Rough Pigtails, Forest Fairy Hair, and Bleached Pony Hair. Check out the Male Face Styles available now: Spoiled Boy Face (NEW! ), Forest Fairy Face, Dreamy Face, Sparkling Face, Crescent Eye Face, and Serene Face. Check out the Female Face Styles available now: Spoiled Girl Face (NEW! ), Forest Fairy Face, Dreamy Face, Sparkling Face, Crescent Eye Face, and Serene Face. Available starting November 30 in the Special Promotions > New Arrivals category in both Reboot and non-Reboot worlds. 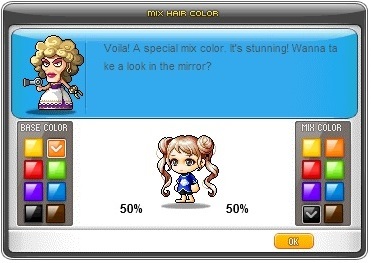 Two new dye coupons are available to give your hair that special color! The Mix Dye Coupons work by mixing one of eight base colors with one of eight mix colors to create a unique hue. When you use the Mix Dye Coupon, you can choose which colors to mingle. When you use a Mystery Mix Dye Coupon, the colors are selected randomly. To use, purchase one of the coupons from the Cash Shop and move it to your item inventory. Double-click it to receive a 14-day ‘Use’ coupon. When you use the coupon, you can either select your color mix, or one will be selected for you (depending on which coupon you purchased). The new hair color will be applied immediately. You can use these coupons anywhere and don’t have to visit a salon. November 30 to December 15 in the Special Promotions > Limited Time category in non-Reboot worlds only. What adorable kitties! Take home Tiny Nero, Cheesy Cat, or Samson Cat—or collect all three! These pets come with an equip to wear, yummy pet food to eat, a Pet Name Tag, and some useful pet skills and scrolls. This is a permit that opens a Christmas store! You can open it anywhere in the Free Market and sell up to 24 items at once. Available for a limited time only! November 30 to December 15 in the Special Promotions > Discounted category in non-Reboot worlds only. 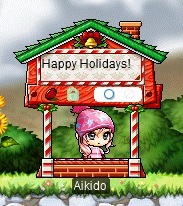 Open one of these meso sacks to receive a random amount of mesos! Open a Rare Meso Sack to receive 2,000,000 or more mesos, with a small chance to get up to 54,000,000 mesos. Open an Epic Meso Sack to receive 4,000,000 or more mesos, with a small chance to get up to 208,000,000 mesos. Open a Unique Meso Sack to receive 6,000,000 or more mesos, with a small chance to get up to 750,000,000 mesos. Adventurers work hard, and these packages aim to make it easier for you to get all of the useful items you need! With three packages available, there’s sure to be one suited just for you. Choose from the Leveling Package, Deluxe Leveling Package, or Premium Leveling Package. December 1 to January 1 in the Special Promotions > Limited Time category in both Reboot and non-Reboot worlds. Pick up these wintery weather effects that are just right for the season! Snowflakes, Sprinkled Presents, Snowy Snow, and Holiday Sock display graphics on the map where your character is for 30 seconds. Snowy Snowman, Tree Décor, and Winter Knit Fest give Weapon ATT/Magic ATT +30 to everyone in the map for 15 minutes. You can enter a message of your choice. Each weather effect has a 7-day duration. November 30 to December 15 in the Special Promotions > Limited Time category in Reboot world only. Take home an adorable kitty pet! Pick up Tiny Nero, Cheesy Cat, or Samson Cat, and let these little buddies join you on your adventures in Reboot World!